Notes: Flower heads yield bright yellow-orange shades for fabrics. 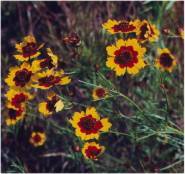 COREOPSIS TINCTORIA. Important dyeplant: flowerheads yield bright yellow-orange shades to fabrics. Cheery garden plants.